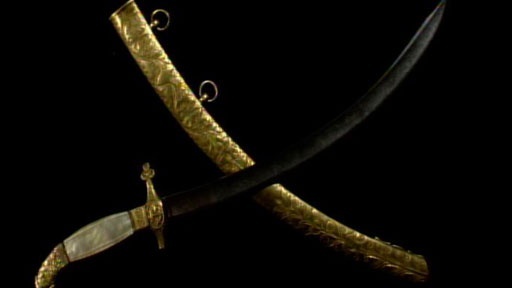 OVERVIEW: An ornamental sword with gold-plated scabbard and gold and pearl handle, the blade consists of specially forged Al-Kasraj steel (OOC: Damascus steel). It acted as a ceremonial blade for Temrkai Khan, the Khagan of the Jelbic Peoples between 3637 and 3645. After the death of the Khagan the blade passed through different hands, eventually ending up in the private collection of the Vanukean royal family. It was handed as a diplomatic gift to Jianxiao Emperor in 4433. TYPE: Oil on canvas. 130.7 by 95.6 cm; 51½ by 37⅝ in. The painting displays not only [Bae Woo-hyeon's] unbridled, virtuosic expressionist aesthetic but also a distinctive trace of her Gao Showan roots. Forsaking outline and brush, Bae threw paint and acrylic on his canvas in thick, spirited spatters, dripping, heaping and layering with knives: the resulting marks and sinewy trails are fluid and lithe as if borne by wind, embodying the vigor and dynamism of splashed calligraphic ink. Bae's astonishingly complex pictorial surfaces are at once rugged and majestic, exuding a quietly gripping cosmic dynamism that is humble yet transcendent. Mesmerizing sheens of color shimmer through a glossed lacquer finish reminiscent of traditional Gao-Showan pottery. 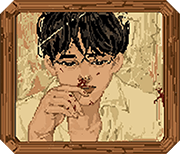 Bae's art is directed toward the sources, and goes back to the primitive elements of Gao Showan art, whose masterpieces formerly realized the perfect unity of signs and matter. 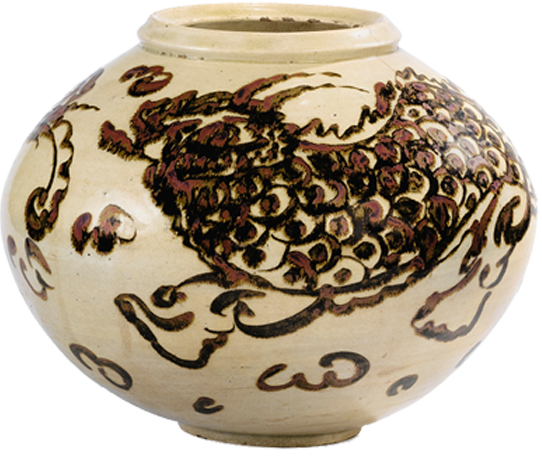 OVERVIEW: This piece is a porcelain vase from the Baekgu Dynasty of flattened globular form, with a vividly painted border of a long dragon flying among the stylized clouds. The brown of iron-based glaze has turned red and purple against an ivory background traversed by fine cracks. The piece was purchased by the Ryeo Foundation for $24,000 at the Bae Foundation Fundraising Gala in Yonseo, Dankuk. Prior to the auction, the piece was kept in the private collection of the House Bae of Yonseo for generations. 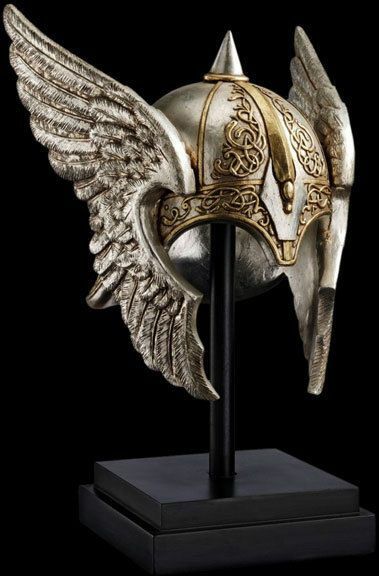 OVERVIEW: this gold encrusted helmet of the Kazul Warrior, Gærhialm the architect of Skalm sports steel wing enchanted by Baug, the Goddess of Seas and Winds. Gærhialm wore the helmet during his crusade across eastern Kazulia against the invading Befäskar tribes. The Helm of Gærhialm enables the wearer to fly and exist alongside aquatic entities. TITLE: "Spring Mist Over Tan Hua Palace"
TYPE: Ink on silk. 207 by 563.2 cm; 81½ x 18 ft. 5¾ in. OVERVIEW: This painting was created in the Beiyidom of Fehua in the year 1596. The piece was commissioned to Zheng Cai by the Cheng Clan in celebration of the 80th anniversary of the Tan Hua Palace in Yincheng, and still resides within the Cheng Clan's private collection. The nearly priceless artifact is made up of a set of 12 different scrolls. Despite the time period of its creation, the painting represents the Cheng's palace in Yincheng with incredible detail, as not only are the palace and general landscape visible, but each flower blossom and person within it are beautifully depicted by Zheng. Last edited by pandowlpaws on Mon Oct 08, 2018 11:19 pm, edited 1 time in total. OVERVIEW:This piece was created in response to the Keymon governments decision to become involved in the Dovani War. 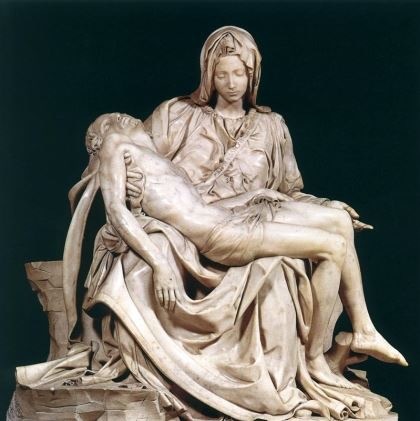 The sculpture shows a mother holding her dead son, which was a political statement on how Keymon lives would be lost in the war. The artist, Chloe Pulou, was a well known anti-war advocate and protested the government’s involvement through the war and even after. OVERVIEW: This diamond tiara was created by iconic Indralan jewellery designer Tan Yu on commission by Prince Jianhao of the Imperial Clan of Indrala. The tiara is set with old Artanian-cut, square and baguette diamonds, mounted in platinum. Diamonds are estimated to weigh approximately 70 - 80cts in total and are on average F - G colour, mostly VS to SI, a few are I clarity, as gauged and graded in the mount. The tiara evokes a peony motif, referencing the official flower of the State of Indrala. Thus, it has become known as the Peony Tiara. The tiara was presented to Princess Lina of Indrala and Lourenne by her grandfather, Prince Jianhao, on her 18th birthday in advance of her first state visit to Lourenne. TYPE: Ink on panels. 180 by 47 cm; 5 ft. 10 in. x 1½ ft.
OVERVIEW: The piece was created two centuries ago by Cheng Xiuying, who is regarded as the former matriarch of the modern day Cheng Clan. Made up of 12 different panels, it depicts the varied landscapes of the Indralan countryside and wilderness. Along with the paintings, each panel contains a poem written by Cheng herself. While the artwork is owned by the Cheng Clan of Indrala, it is currently on loan to the Kaizhou City Museum of Art (KCMA) for the exhibition "Landscapes of Indrala"
TITLE: "Alongside the Montañas Celestiales, Ralston"
TYPE: Oil on canvas. 183 x 305 cm; 72 x 120 1/8 in. OVERVIEW: This pastoral scene was painted by Wolfgang Schottenstein, a Dorvish explorer and graduate of the Cedar River School in what is present day Westbrook, Baltusia. In impeccable detail, a famous aspect of most of Schottenstein's works, it depicts the Montañas Celestiales, which cover mostly Ralston and twist southwestward through New Egelion, a part of the Greater Seleyan Mountain Range that snakes through most of the continent. A herd of deer also congregate alongside the bank of a river, which Schottenstein states from his diary spontaneously grazed into his vision whilst he was painting. The painting was donated by the Cedar River School to the National Institute of Baltusian Art and Culture in 1981. OVERVIEW: "Fortland", originally known as the "Barreau Tower" after the name of its architect, was constructed by Rildanor during the 2570s in order to protect shipping lanes between Noumonde, its newly-acquired colony, and south Seleya. Recently, Fortland has been commandeered by Geoffrey Briggs, a retired major in the Luthori army and a noted eccentric. Briggs has set himself up there along with his wife, Shirley. His son, Henry, and daughter, Elizabeth, occasionally stay him with as well. 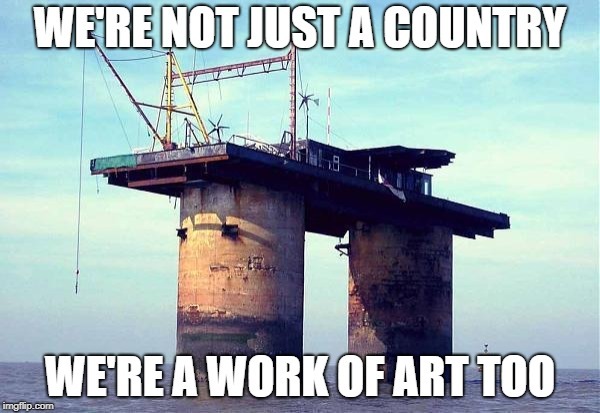 As well as being Terra's newest nation and a country with great aspirations for the future which personifies the ideals of liberty, justice and equality, Fortland is also a splendid work of art from a purely architectural point of view, as well as a unique historical artifact, being one of only four installations of its type and of its era anywhere in Terra. Artists regularly come to draw it, and photographers to photograph it. In addition to this, Fortland hosts small permanent and temporary art exhibitions, making it a much-loved destination for art luvvies.